After ingestion of cysts, an incubation period of 3-20 days exists before symptom onset. At the time of presentation, patients have generally had symptoms for 7-10 days. 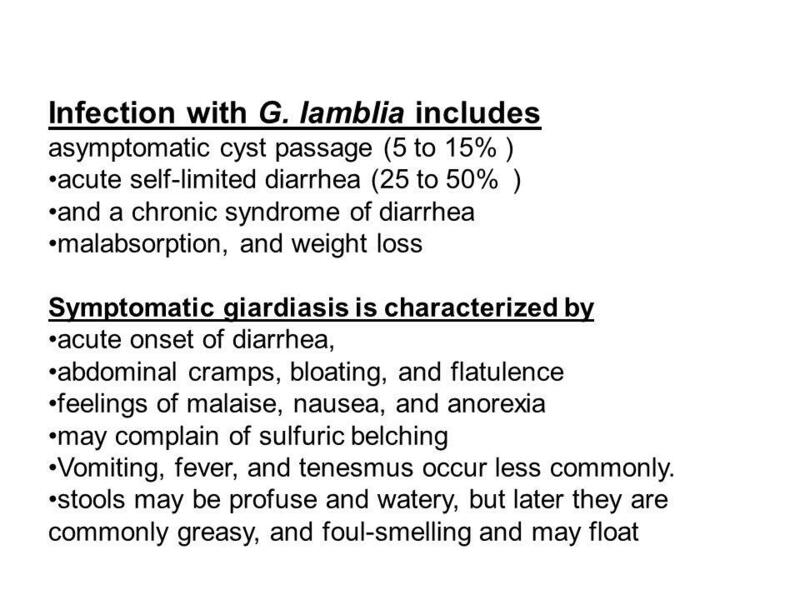 The predominant symptom in acute giardiasis is diarrhea, occurring in 90% of patients, accompanied by generalized malaise (Box 1). Patients describe initially profuse and watery stools progressing to foul-smelling and often greasy stools that float. Flatulence, bloating, and abdominal cramps are frequent concerns as are belching, nausea, and anorexia. Weight loss and vomiting are less frequent, and fever is rare. Symptoms are usually self-limited to 2-4 weeks. Laboratory studies are notable for a normal peripheral leukocyte count without eosinophilia. Stool studies are negative for the presence of mucus, leukocytes, and blood. C parvum, rotavirus, and toxigenic Escherichia coli may all have similar presentations. Rare associations with urticaria and reactive arthritis have been reported in giardiasis. Biliary tract disease and pancreatitis have been reported, as have retinal arteritis and iridocyclitis. Gastric infections have been seen in G lamblia patients with achlorhydria. From 30% to 50% of individuals with acute giardiasis will progress to have chronic giardiasis. Profound malaise and lassitude are frequently reported. Patients experience diarrhea alternating with constipation, frequent stools, and abdominal pain associated with eating. Weight loss of 10-20% of body weight is common, with a 10-lb weight loss reported in 50% of patients. Headache has also been associated with the syndrome. Laboratory studies are significant for biochemical evidence of malabsorption. D-Xylose, fat, protein, vitamin A, and vitamin B12 malabsorption have all been reported. Disaccharidase deficiency, particularly lactase, occurs in 20-40% of patients and may persist for several weeks beyond infection. Macrocytic anemia from folate deficiency and hypoalbuminemia has been reported. Similar presentations can be seen in infections caused by coccidians such as C parvum, I belli, and Cyclospora spp., as well as infections caused by Strongyloides spp. and Entamoeba histolytica. Also, diagnoses of inflammatory bowel disease and irritable bowel syndrome should be considered. Chronic giardiasis may play an important role in growth impairment and nutritional deficiency in the developing world. 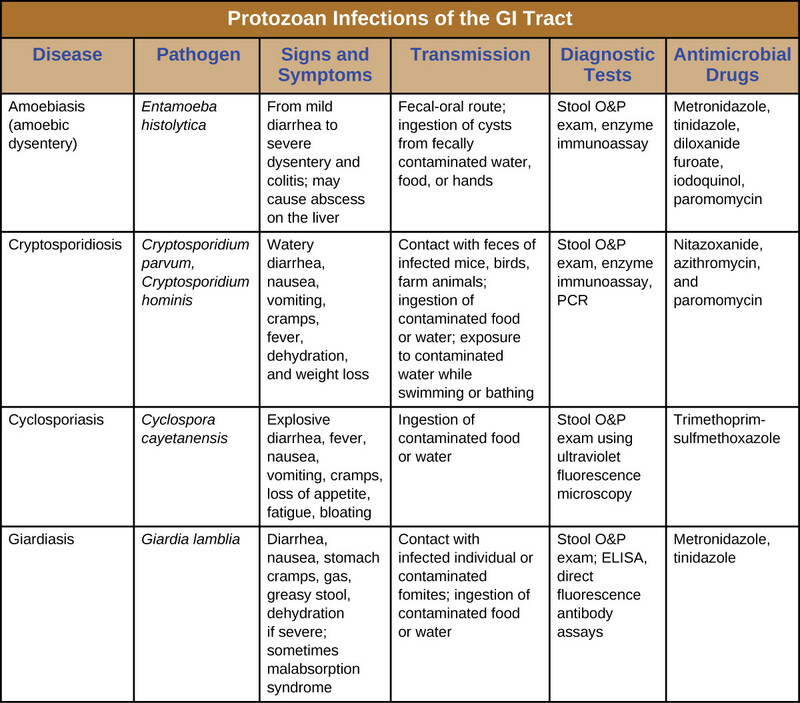 The key to diagnosis of G lamblia infection is the identification of trophozoites or cysts, both of which can be seen in stools by standard ova and parasite exam (Table 1). Trophozoites have a short survival time outside the small bowel when not contained within cysts and are more likely to be seen in fresh wet mounts of liquid stool. Semiformed stool may be preserved in formalin or polyvinyl alcohol. Staining with trichrome or iron hematoxylin reveals cysts. Formalin or zinc flotation concentration techniques may increase the yield of diagnosis. Generally, one stool exam has a 50-70% diagnostic yield, which improves to 85-90% after 3 stools collected over 2-3 days because of cyclic shedding. Purged samples have no effect on diagnostic yield. Enzyme immunoassay and direct fluorescent-antibody assay kits are commercially available for testing for G lamblia infection. Both methods have reported sensitivities of 87-100% and specificities of 99- 100% when compared with microscopic stool examination. Advantages of these techniques include a decrease in both examination time and required technician training. Both direct fluorescent-antibody assay and enzyme immunoassay are particularly valuable when the sole diagnosis or exclusion of G lamblia is needed, as may occur during an epidemic or for screening purposes. Although cost of antigen detection techniques is similar to ova and parasite microscopic exams, microscopy allows for diagnosis of other possible pathogens. One commercially available direct fluorescent antibody assay kit does detect both G lamblia and C parvum, however. Other, more invasive techniques are rarely used but may contribute to diagnosis. The string test involves swallowing a capsule attached to a nylon string. The capsule sits in the jejunum for 4-6 h while the patient is fasting. The string is subsequently removed and examined for trophozoites by microscopy. A duodenal aspirate can be similarly examined. Also, a duodenal biopsy or endoscopic brushing can be examined for trophozoites, by using Giemsa stain. Upper gastrointestinal aspirates can be cultured, but this test is generally not available clinically. Serology, too, has little clinical utility but may be helpful epidemiologically. Serum immunoglobulin M or IgA titers are indicative of recent infection as compared with IgG titers. Polymerase chain reaction and gene probe studies are still in experimental stages, with their most practical limitation being extraction of DNA from the stool sample. Historically, quinacrine hydrochloride has been the drug of choice for the treatment of giardiasis, with 90% efficacy. However, this drug is no longer produced in the United States. Despite having never received a Food and Drug Administration indication for giardiasis, metronidazole is the first-line treatment, with 80-95% efficacy after a 7-day course (Box 2). Its efficacy is considered to be related to inhibition of attachment. Because of the disulfiram effect of metronidazole, patients should be warned that concurrent use of ethanol could cause flushing, tachycardia, and nausea. Tinidazole is also considered a first-line agent with 90% efficacy, but it is also not available in the United States. Second-line agents include furazolidone and paromomycin sulfate. Furazolidone, a nitrosourea with 80% efficacy, may be particularly useful in children because it comes in a liquid form. Paramomycin sulfate is an aminoglycoside with 60-70% efficacy. Because of its poor oral absorption, it may be beneficial for use in pregnant patients. Ideally, treatment for giardiasis in pregnancy should be delayed until after delivery. Metronidazole may be safe after the first trimester, however. Variable sensitivities of isolates to drug regimens occur, and resistance to metronidazole and furazolidone has been reported. Other drugs with reported benefit against G lamblia infection include some antidepressants, fusidate sodium, D- and DL-propranolol, mefloquine, doxycycline, and rifampin. Albendazole, an anthelmintic benzimidazole derivative, may prove to be effective in treating giardiasis and may be especially useful in developing countries for dual coverage. The natural history of untreated giardiasis is unknown. Chronic persistent diarrhea may develop in a small number of patients, some of whom, particularly children, may develop malnutrition and growth impairment. The prognosis of treated giardiasis, however, is excellent. Because of the worldwide presence of Giardia spp., vast human and animal reservoirs, and environmental resilience, total elimination of giardiasis is not expected. Instead, prevention depends on focusing on the primary sources of infection, including water contamination and person-to-person contacts (Box 3). Chlorine kills cysts in warm water, and public water supplies should undergo chlorination, flocculation, sedimentation, and filtration. DNA techniques may be valuable in screening filtered water for cysts. In the wilderness or in the developing world, water should be boiled before consumption. Inactivation is immediate at 100 °C, and water need only be brought to a rolling boil. At altitudes of = 10,000 ft, where the boiling point is 90 °C, water can still be safely disinfected by simply bringing it to a boil. The margin of safety is further ensured by the time taken for the water to heat to this level and subsequently cool because keeping water at 70 °C for 10 min also results in 100% inactivation. Halogenation with iodine or chlorine tablets has proven useful but may not be effective in cold water. The questionable efficacy of halogenation is best exemplified by reported cases of giardiasis associated with chlorinated swimming pools. Water filters with pores < 1-2 um may also be effective in preventing giardiasis. Person-to-person spread of giardiasis could be lessened by improved hygiene, especially in those at high risk. However, evidence is not yet available to support the treatment of asymptomatic patients. Further, no vaccines for giardiasis are available. Vaccine development is limited because the initial infection itself does not confer protective immunity to the patient.